The past year has been full of landmark occasions for the US cannabis industry. Most recently, the passage of the 2018 Farm Bill legalized the cultivation of hemp — a form of cannabis containing less than 0.3% by weight of psychoactive tetrahydrocannabinol (THC) — and the sale of hemp products and hemp-derived products within the United States. 2018 also saw the anti-epileptic drug Epidiolex become the first cannabis-derived medicine to receive approval for use from the Food and Drug Administration (FDA), and we witnessed the passage of medicinal and/or recreational cannabis legalization in multiple states — including Vermont, Missouri, Oklahoma, Utah and Michigan. However, as strides continue to be made in the field of cannabis legalization and regulation, there is one key area which so far remains confusing, convoluted, and impractical: the use of pesticides on legal cannabis crops. Currently, the United States is facing a situation where the cultivation of cannabis plants has been legalized in some states prior to the federal legalization of the pesticides which may be needed to protect these crops. A recent paper published in Crop Protection by researchers at Purdue University identifies and outlines the conundrums that have given rise to this contrary situation, where it would seem that pesticides are being more strictly regulated than the cannabis itself. In brief, these six conundrums are discussed below. Under the 1970 Controlled Substance Act, all species of cannabis (including hemp, as at the time there was no legal distinction made between hemp and other cannabis species) were labeled as being Schedule 1 controlled substances. By the definition of the US Drug Enforcement Administration (DEA), substances in Schedule 1 are thought of as “drugs with no currently accepted medical use and a high potential for abuse”. Though hemp was recently de-scheduled through the 2018 Farm Bill, all other species of cannabis remain Schedule 1 controlled substances, essentially making their cultivation, possession, use, and sale illegal at the federal level. Schedule 1 classification can also make it much harder to study the drug for scientific purposes. With the passage of the 2018 Farm Bill and the subsequent rescheduling of hemp, there are now fewer barriers in the way of furthering research into this crop. However, for the other cannabis species remaining in Schedule 1, these barriers are still in play and can directly impact whether conventional pesticides can be used to treat the crop. Being a federal institution, the US Environmental Protection Agency (EPA), which is responsible for the registration of pesticides for use on certain crops, cannot allow any pesticide to be registered for use on cannabis plants. This is solely down to the continued federal prohibition of cannabis and its Schedule 1 classification. In the United States it is illegal to use a pesticide on a crop without federal registration, meaning that even if it is perfectly legal to cultivate cannabis in a given state, and the use of a certain pesticide is allowed on other similar crops in that state, it would still be illegal to use that pesticide on the cannabis crop. This sort of prohibition not only stops pre-existing pesticides being used on cannabis crops, it also deters pesticide manufacturers from making any investment in specific pesticide solutions for cannabis plants due to the conflicting legislation. There is also a second problem which concerns the EPA. Before trying to go through EPA pesticide registration, a crop is also required to have an established tolerance level — this tolerance is the maximum amount of pesticide residue that is allowed to remain on the crop while still being safe for consumption. Presently, there are no federally recognized established pesticide tolerances known for cannabis or hemp. In addition, due to its prohibition under federal law, the EPA cannot recognize non-hemp cannabis as a legal crop, which prevents the establishment of federally recognized pesticide tolerances for cannabis. The inability of the EPA to formally register pesticides as acceptable for use on cannabis crops has led to state administrators (in states where cannabis has been legalized locally) attempting to find novel work-arounds to this system. This has been achieved by using available alternative EPA programs, such as pseudo-registration programs or applying for registration exemptions. There are four ways of doing this that are mentioned in the paper in Crop Protection, namely: the Federal Insecticide, Fungicide, and Rodenticide Act (FIFRA) Section 24C for “Special Local Needs”, FIFRA Section 18 for “Emergency Exemptions”, FIFRA Section 25B for “Minimum Risk Exemptions”, and through the United States Department of Agriculture (USDA) Minor Use Program. However, despite the existence of these exceptions, the Purdue researchers conclude that their use is more of a stop-gap measure than an actual long-term solution for the authorization of pesticides. In states which do allow for the state-level cultivation, sale, and consumption of cannabis, there is a certain economic pressure on cannabis producers to ensure high crop survival rates and high crop quality in order to maximize eventual profit. As a result, some growers have been known to go “off-label” and use pesticides that are registered for use on other crops in their cannabis cultivation operations. 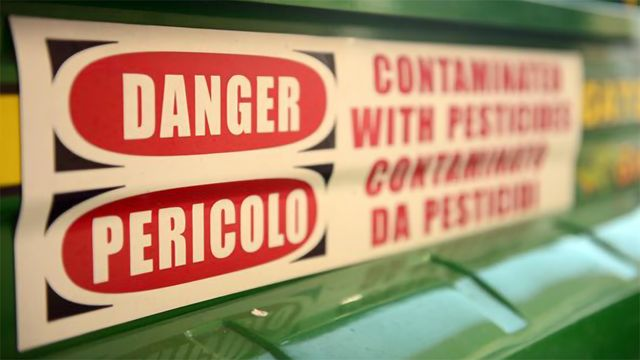 The current language of pesticide residue testing programs in relevant states may also contribute somewhat to this atmosphere where pesticide use feels an acceptable option, despite its illegal nature. By listing certain pesticide residues as acceptable or unacceptable during testing, this can often be mistaken for setting certain tolerance limits for the usage of these pesticides and gives the illusion that these pesticides are appropriate to use on cannabis crops. Conundrum six: is illegal pesticide use a public health risk? There is very little in the way of scientific research that examines the potential health effects of the pesticide products being used on cannabis grown in certain environments, and consumed under certain methods. Additionally, the EPA has carried out no comprehensive risk assessments for pesticides which are likely to be used on cannabis, meaning that it is difficult to determine how serious pesticide exposure might be to cannabis consumers. States which do have allowed pesticide residue limits mostly rely on data that correlates with the lowest legal residue of that pesticide that is allowed on foodstuffs, assuming that this would likely be non-harmful to health. Determining public health risk of pesticide use on cannabis is admittedly very complex. Cannabis is commonly consumed by inhalation from either a burning cigarette or through a water pipe, but it can also be consumed through the oral ingestion of cannabis-infused edibles or an oral concentrated tincture. Each of these methods present different health concerns, based on how the pesticide residues might react under combustion or concentration. Additionally, given how cannabis is often used medicinally, there are extra concerns surrounding the safety of patients who may have weakened constitutions or immune systems. In order to authorize a pesticide for use on cannabis, detailed risk assessments would need to be carried out that would address all of these different variables in order to accurately assess any public health risk associated with the use of a certain pesticide on a cannabis crop. As well as identifying the problems the cannabis industry faces concerning pesticide access, the Purdue researchers also identify key steps that could be taken in order to smooth out these difficulties. Most importantly, Congress must decide whether cannabis should remain a Schedule 1 substance. By definition, Schedule 1 drugs are thought to have no medicinal benefit and a high potential for abuse; yet scientifically there is strong evidence that cannabis does have significant therapeutic benefits, and though Cannabis Use Disorder (CUD) has been documented, there appears to be little difference in lifestyle and health effects between cannabis users who do and do not have CUD. The rescheduling of Cannabis to a lower schedule would allow federal institutions greater freedom when it comes to cannabis, and cannabis pesticide, research. From there, it would also become easier for state agencies and federal institutions to reach compromises when it comes to pesticide management, as well as to carry out effective hazard assessments. Clearly, some sort of reform is needed to move the conversation along, and to ensure that cannabis users in the United States are not exposed to unsafe cannabis, whether that be through contact with cannabis material that has been harmed by pests or infection, or through consumption of unsafe pesticides.